For many Discrete Manufacturing Enterprises, technology solutions are not all just about ERP (enterprise resource planning). Certainly the ERP is at the heart of the technology portfolio of any discrete manufacturer. In addition to the core roles played by ERP solutions, many other areas often are necessary to provide full support for the broad range of requirements that many discrete manufacturing companies now face. Our software solution selection practice has led us to develop a different view of the solution providers from the traditional analyst view of corporate size vs. vendor size and functional footprint. We recognize that for the discrete manufacturing industry the solution set that an enterprise may need goes beyond just the core ERP system. A significant technology solution necessary for most discrete manufacturing is manufacturing execution systems, or MES. MES can operate across multiple functional areas within the shop floor management arena. These areas can include: management of product definitions across the product life-cycle, resource scheduling, order execution and dispatch, production analysis and downtime management, product quality data sampling and reporting, or materials track and trace. Manufacturing execution systems are also the system of record for the creation of the “as-built” documentation and lot tracking for what has been produced. To accomplish all of this they are often central to capturing the data, processes and outcomes of the manufacturing process. This can be especially important in regulated industries, such as food and beverage or pharmaceutical, where documentation and proof of processes, events and actions may be required. The vendor ecosystem for food & beverage (and process) has evolved into a set of vertical market component applications which surround ERP. With respect to the remainder of the supply chain, the trend away from the “warehouse store” concept, combined with the above, has resulted in a trend of smaller, more frequent orders, which has put pressure on companies to combine (LTL) shipments and optimize transportation and related costs, at the heart of which is Transportation Management (systems). With this added complexity, cost, and need for higher precision, more than ever, companies also require the ability to plan, forecast and budget more accurately, and closely monitor performance using tools like Integrated Business Planning (IBP). Our vendor eco-system for discrete manufacturing is the only one its kind which has assembled this comprehensive group of solution providers focused upon the nuances of the discrete manufacturing industry, on a global scale. 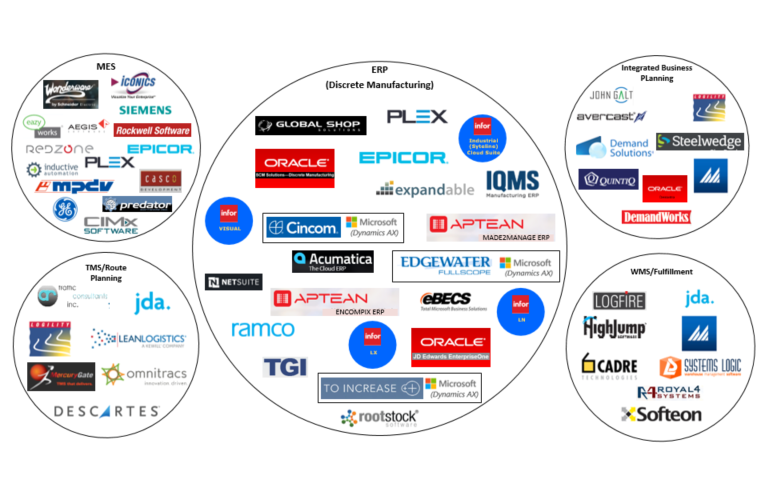 For more detail on the Solution Ecosystem for Discrete Manufacturing, please see our report in the Resource Center Vendor Profiles, or just click on the link above.